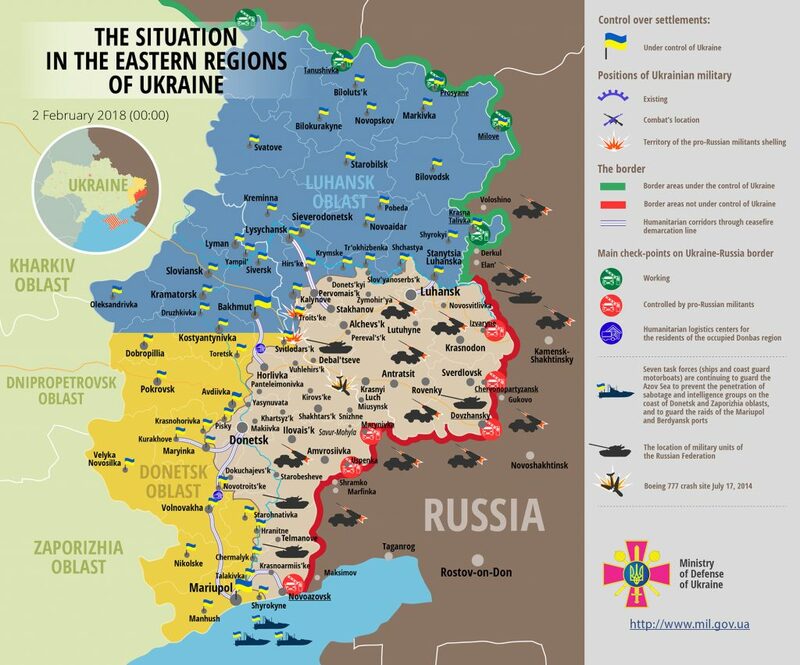 Over the last day, Russia-backed militants delivered four precision attacks on Ukrainian troops’ positions, all the attacks took place in Luhansk sector, reported Ukrainian Ministry of Defense spokesman on ATO Colonel Dmytro Hutsylyak at a press briefing at Ukraine Crisis Media Center. All the ceasefire violations took place in Luhansk sector yesterday. Russian proxies fired fifty-six 120-mm mortar rounds in Luhanske and Troitske areas. “Additionally, militants used IFV mounted weapons and heavy machine guns. They also fired several 82-mm mortar rounds near Luhanske,” the ATO spokesperson said. Ukrainian troops returned fire four times yesterday. Report on the military developments as of February 1 is available here. Interactive data on the shelling: chronology shelling chart and the interactive map.